Travels, trials, and triumphs & other foodie curiosities. Everyone has experienced the disappointment of buying a lovely looking piece of fruit only to discover it is as appetizing as cardboard. Deborah Madison hopes to redeem the paradise-lost pleasures of truly ripe fruit. 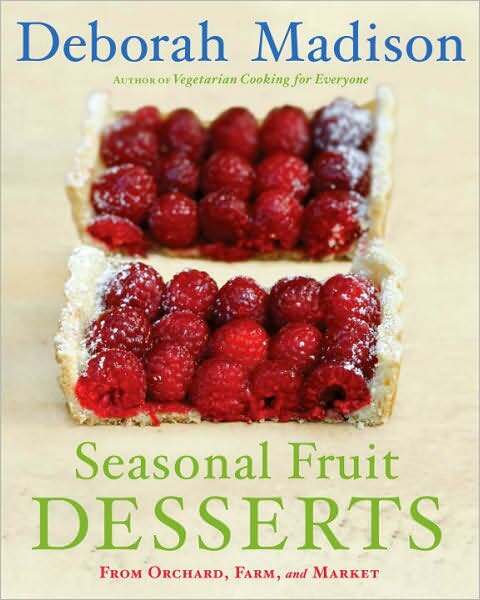 The cookbook guru has written a bit of a love letter to summer’s jewels with her new “Seasonal Fruit Desserts” (Broadway Books, $32.50). A perusal of the gorgeous photos alone will prompt you to rush to your nearest Farmers’ Market and load up your canvas shopping bags. How about them apples – er – pawpaws? As always, Madison offers tips for preparing fruit, techniques for coaxing the best flavors out of your dishes, and advice on the best kitchen equipment to have on hand. “Seasonal Fruit Desserts” will set you up perfectly to enjoy the sweetness of slow summer evenings. Read my article about shopping at Farmers’ Markets and listen to my interview with Deborah Madison by clicking here. Make that French Vanilla yoghurt. Cream Top. Top it with a little orange zest. @Aubrey — doesn’t pawpaw sound cool? I do miss Georgia’s peaches. Happy summer! I remember Paw paws. We are now picking wonderfu cherries from local trees. Cherry pies, cherry coblers and cherry yogurt ice cream- also, Yumm…..
Let me know if you find them! From what I don’t understand they are hard to ship.